In sunny Florida, residents of a new master-planned community know what it truly means to live in luxury. The Place at Corkscrew, being developed by Cameratta Companies, offers families a variety of home options and amenities carefully selected to promote a strong sense of community and high-end living. The Cameratta team is also celebrating 40 years of land development and construction. Cameratta Companies specializes in land acquisitions, project design, entitlement oversight, development, and construction. The new gated community sits on 1,361 acres in Estero, Florida, just a few miles from the Gulf Coast. With a southern plantation-style theme throughout and luxury amenities around every corner, Cameratta Companies believes The Place at Corkscrew will be a hit with residents. The Place at Corkscrew was recently named number #1 selling community in Southwest Florida and follows in the footsteps of the firm’s previous award winning and number #1 selling communities which include The Preserve at Corkscrew and Corkscrew Shores, also located off Corkscrew Road in Estero. Plans for The Place at Corkscrew call for 1,325 single-family homes across its sprawling acres. One of the elements making the new community stand apart from other master-planned communities in the area is the attention to detail the Cameratta team have used to shape it. The Place at Corkscrew offers amenities for people of all ages. Extreme care went into making even small decisions, such as the features of the community playground, to ensure families remain safe while still having fun. For example, unique shade structures near the playground help protect families from the sun, while a zip line provides a one-of-a-kind recreational experience for kids and adults alike. The amenity complex, which is now open, features a luxurious pool and spa area. There is a child-friendly splash pad with 57 jets, two 20-foot waterfalls and a 100-foot water slide leading into the pool. On the other side of the pool, adults have a space of their own. 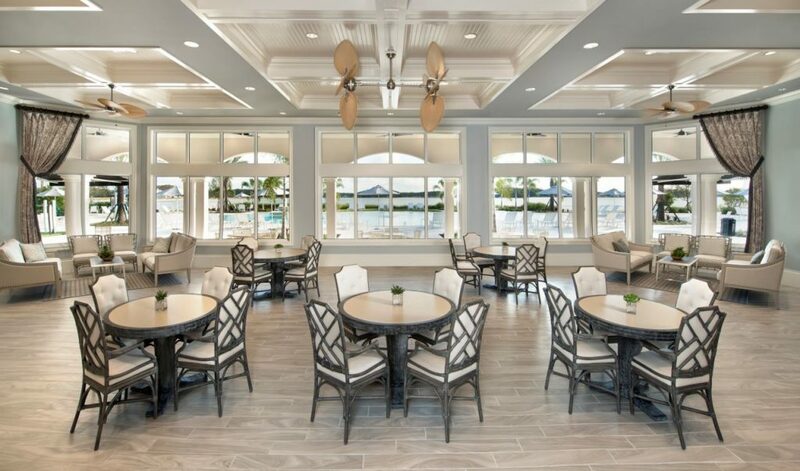 An oversized spa, beach volleyball court, a full-service sports bar and grill restaurant, and a Bourbon Bar where adults can enjoy a night out with some friends. The restaurant and Bourbon Bar are scheduled to open Summer 2019. Inside the grand clubhouse, residents have a 2-story state of the art fitness center, a movement studio, a staffed kids club and a café marketplace with Wi-Fi and snacks. They can also stay active outdoors at the tennis, pickleball, bocce and basketball courts. In addition to the pool, fitness and cafe, Cameratta Companies has delivered on another unique element to the community: a custom-built trolley. It can hold up to 20 passengers at a time, transporting them throughout the community. 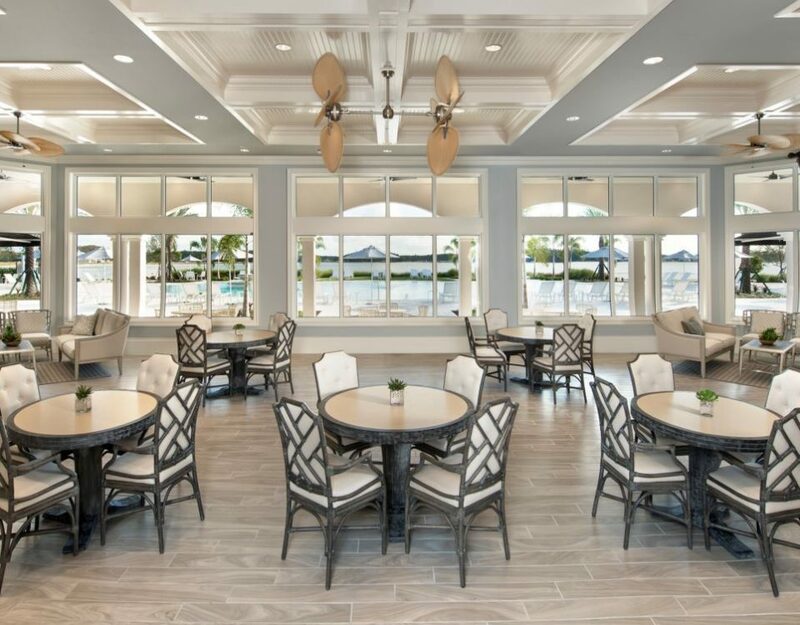 The style of The Place at Corkscrew is described as “southern plantation-inspired,” and the team at Cameratta Companies, along with the homebuilders and designers, have worked together to ensure consistency throughout the development. Yet another example of the company’s meticulous attention to detail, predetermined colors, finishes and home styles help tie every home lot into the look and feel of the overall community. J.R. Evans Engineering is serving as the engineer on The Place at Corkscrew, while Pulte Homes and Lennar Homes have been selected as the home builders. Each homebuilder has been contracted to take on 50 percent of the homes, and each homebuilder offers the community something different, as well. Lennar Homes is incorporating considerable technology into its homes, effectively creating a “smart home” community that’s seeing a great deal of interest from buyers. Pulte Homes continues to add new floor plans to its lineup to give buyers a high degree of flexibility and customization. “Both builders have been outstanding to work with and have done a great job on the sales and marketing. It has been a pleasure to work with both of their teams,” Cameratta said. Cameratta Companies also took efforts to respect the land on which the community is built. The firm has worked with the Lee County government, at no additional cost to local taxpayers, to devote more than 750 acres to protected wetlands and uplands and to restore old water flow-ways that aid in drainage.